Motorized blinds and shades are a popular choice for out-of-reach windows or for numerous shades that you want to raise and lower in unison. They are sleek and easy to use and add an up-scale touch to the home or office. This guide walks you through the various types of motorized options, how they are powered, and how they are controlled. Motorized window treatments typically come in two varieties, depending on the type of product: motorized lift or motorized tilt. Motorized tilt is more typical on slatted blinds like wood or aluminum, while motorized lift is more typical on shades like cellular, Roman or roller. After you select the blind type and determine tilt or lift, you must select a power source for your motorized blinds. There are three basic options: a DC power adapter, battery tube or solar power kit. Solar Power Kit: The solar power option is an eco-friendly choice that is ideal for windows that are routinely in direct sunlight. It requires no batteries or cords and offers a sleek design. Battery Tube: The battery version is the best option when it comes to a smooth design flow. It fits easily within the window treatment and doesn’t require a nearby outlet to operate. DC Power Adapter: Motorized controls with a DC power adapter are easy to install and require very little set-up. This is a good option when a power source is nearby. Since there will be a visible wire along the wall, this option will be more noticeable the further away an electrical outlet is. The DC power adapter also avoids the use of batteries, which lessens the likelihood of a stalling problem and makes them more reliable. Once you’ve selected how your blinds are powered, you will need to decide how to control them. There are three basic options: wall switch, remote and programmable timer. Remote: The portable remote is a great option that allows you to control the blinds from any position in the home or office. You can choose a single channel or five channel. Single Channel: This is a great option for an individual window or small group of windows in a small home office or bedroom, where the remote can be stored in a desk or nightstand. Five Channel: The five channel remote is the best option for rooms with multiple windows or to function across more than one room. It allows you to move blinds or shades in pre-determined groups or individually, which gives you greater light control and privacy. Wall Switch: This option works through an installed switch on your wall, much like a light switch. It is a great choice for larger rooms like a living room or media room. Single Channel: You can choose a single channel switch, which will operate a single blind or multiple blinds in unison. Five Channel: For more control over multiple windows, you can choose a five channel wall switch, which allows you to move up to five shades individually. Choose varying heights or control different groups of shades in multiple rooms. 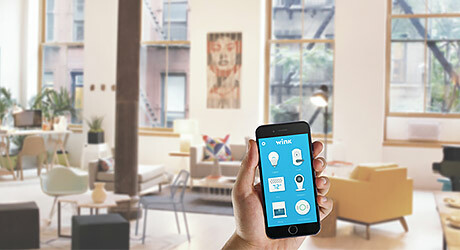 WINK App Control: The WINK mobile app allows you to control multiple window coverings with a touch of a button, from anywhere. Program your blinds to open and close at specific scheduled times or sync your blinds with other smart products to have them operate at the same time. It is an easy and convenient way to control your window coverings whether you are home or not. Programmable Timer: If you prefer a solution without remotes or a wall installation, a timer can be used to open and close your blinds or shades at a predetermined time each day. This means you can automatically have your shades open each morning, acting as an alarm clock. Or you can close them at high-intensity light periods each day to protect your furniture from harmful UV rays. It is also a useful option for vacation homes or times when you will be away but want the appearance of a lived-in home.